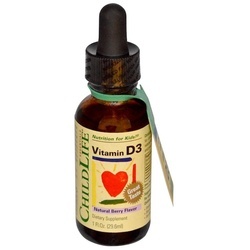 Childlife Vitamin D3 Natural Berry DescriptionNutrition for Kids!Great TasteNatural Berry Flavor ChildLife Vitamin D3 is made especially for infants and children. Alcohol free, all natural ingredients, optimum absorption and great tasting natural berry flavor. Health Tip: Recently, the American Academy of Pediatrics doubled its recommendation for the amount of vitamin D that all children should receive. These recommendation have resulted from new studies reflecting the many benefits of vitamin D including support for healthy bones and a healthy immune system.Free OfGluten, casein and alcohol.DisclaimerThese statements have not been evaluated by the FDA. These products are not intended to diagnose, treat, cure, or prevent any disease.